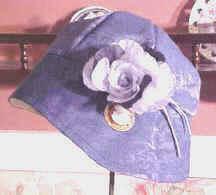 This page is where you get to show or show off your creations that have been made using our Hat Shapers. You are welcome to post almost anything next to your photo. 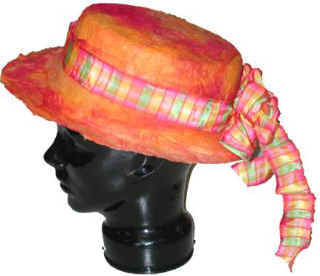 Educate us, sell to us or just tell us about how much fun you had making your wonderful new hat. Send me a photo via email or regular mail and I will put it up on this sight as soon as I can. 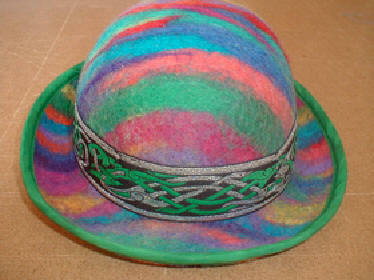 Lady Diane wasn't clowning around when she made this Bowler for a real clown! 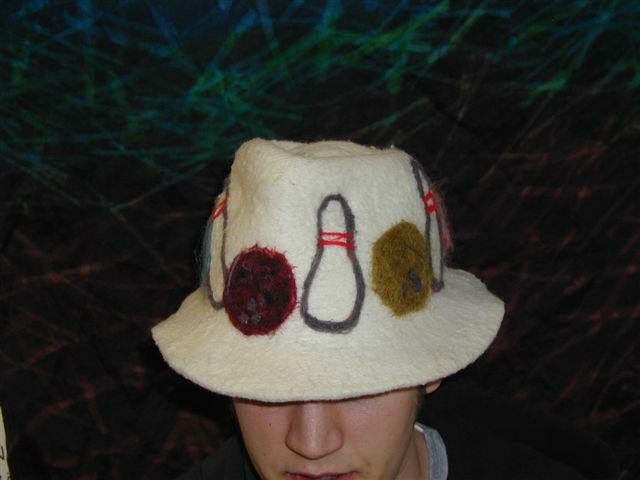 Lady Diane made this Bowler for clowning around in too. 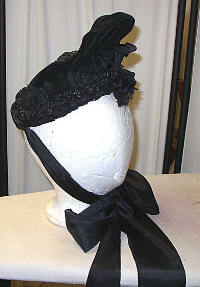 It is really a fantastic and well done hat! 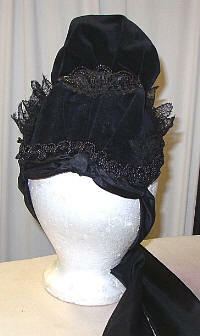 This Beautiful cloth bonnet was made by Deb Hathaway on a FEZ Hat Shaper. See what you can do with a little imagination? 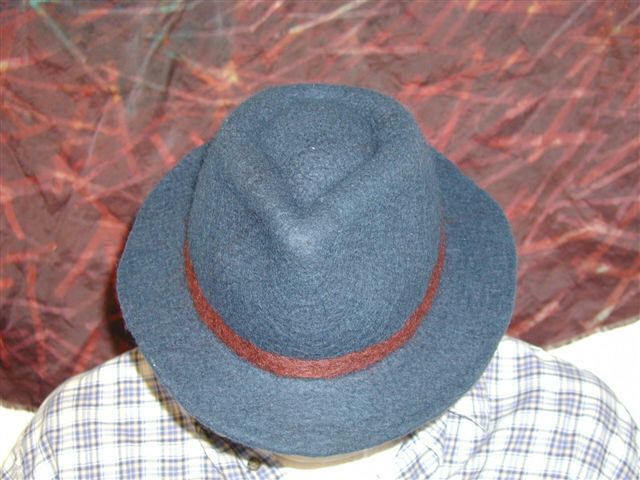 Elsa Leyden made these beautiful men's hats with her own alpaca fiber. 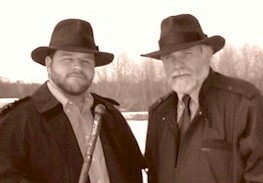 A Gambler, and Amish, a Fedora, and an Explorer Fedora. The trims and accessories really make a great difference. 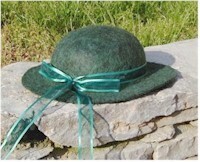 Elsa "Overdyed" the alpaca fiber to make these fabulous women's hats. The hatbands are perfect! 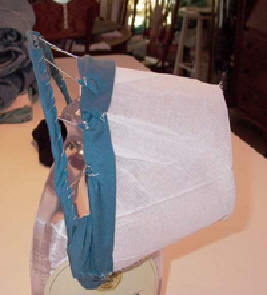 She used a Bucket Hat Shaper, a Dome and a Gambler to make these. Well Done Elsa! Pat Mead of West Valley Alpacas made these hats... in the front row you will see a Western, an Amish, a Fedora... in the back row, Domes... Very nice Pat, thanks for sharing the photo. 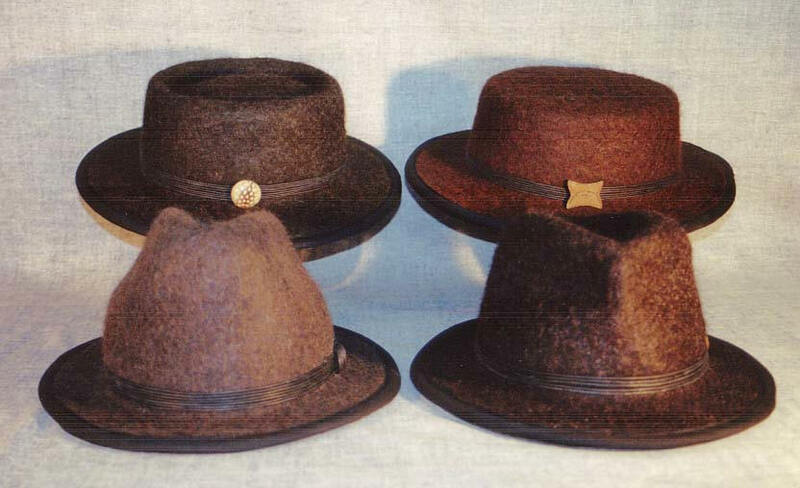 These are the Explorer Fedoras that are seen in the slide show on the homepage. They are made from Llama. 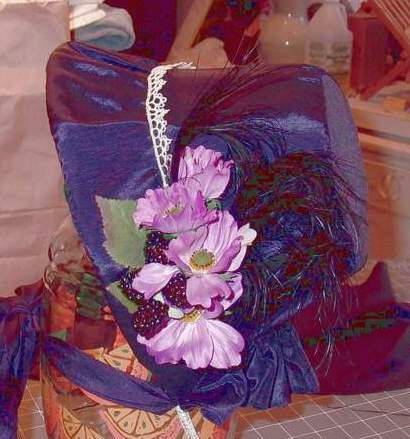 There is a padded sweatband on the inside, a nice milliner's ribbon hatband and bow and the outside and the brim is finished with a piece of double folded bias tape. 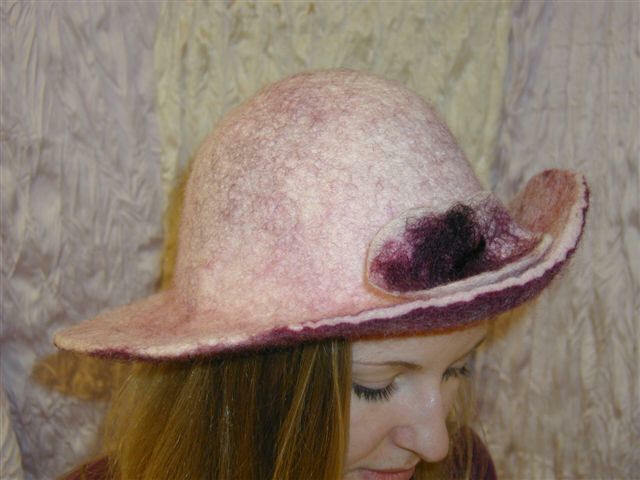 This beautiful hat was made at the Seldom Scene Farm by Lindy... She used overdyed alpaca fiber on a Padre. The Bow is a lovely touch. 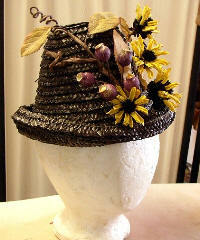 This beautiful hat was especially designed for a special class taught by Marna Jean Davis. It is loosely based on a drawing found in the1886 Bloomingdale Brother's catalogue. She named it the Welsh Crown. 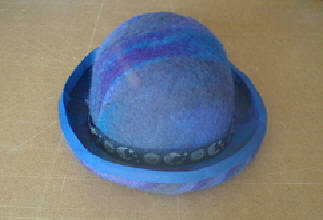 using a 'knit and felt' pattern, too. 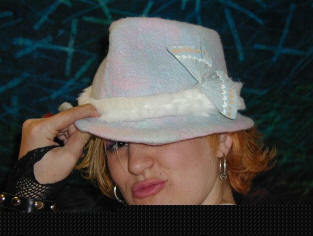 Dana made this great hat using the Western Style Hat Shaper. She finished the edge with a great stitch! Dana said this was called a McClellan Style Crown. If you look hard you will see that this is an officer's hat. I think this is my favorite, so far anyhow. 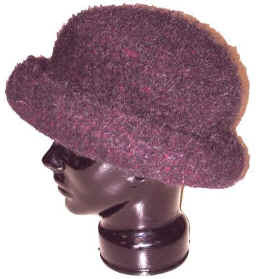 This great wool hat was made on our Amish Style Hat Shaper. I can hardly wait to see how Dana will embellish this! This photo was sent in by Barb Marr of Marr Haven in Allegan, Michigan.http://www.marrhaven.com. Her customer Judy Jergensen of Custom Cameos, makers of cameo jewelry featuring families and their pets, made this on one of our Original Classic Dome Hat Shapers. 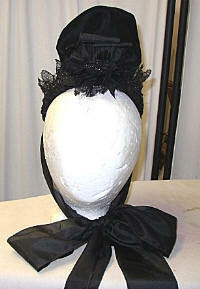 Judy says, "The Cloche is made out of cotton brocade fabric. The Hat Shaper really helps when I steam the crown of the Cloche." Nicely done Judy. Thanks for sending us the photo Barb! Thank you for the Pix! Thank you for sending us your photos. 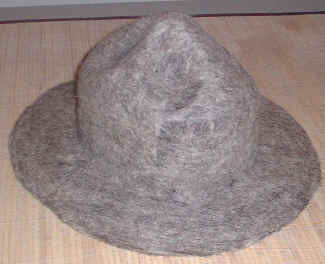 Wanda made this beautiful Amish Hat with Icelandic Batting. Her first hat ever! She added an extra wide brim for balance. Great Job!